It is a busy and exciting time for European research at the ADS! Within the last six months, we have started three new projects; each of which have important research trajectories in their own right, but the timing of many of the initiatives within these projects is proving particularly fortuitous. In addition, the 12-month, AHRC funded SENESCHAL project is already bearing fruit which will be of great use, and an important exemplar for Europe. All of these projects together, while daunting to organise, have created great momentum and discussion around a wide variety of research areas here at the ADS. After the kick-off meeting in February in rainy but beautiful Rome, we have now begun work on Advanced Research Infrastructure for Archaeological Dataset Networking (ARIADNE). 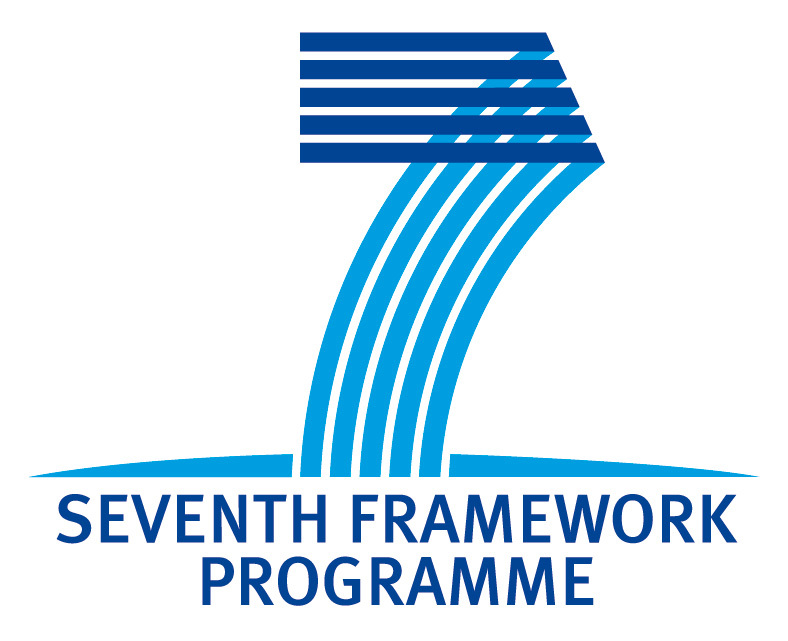 A four-year EU FP7 Infrastructures funded project, ARIADNE is coordinated by PIN at the University of Florence and ADS (Deputy Coordinators), and is made up of 24 partners across 16 European countries. ARIADNE has the ambitious goal of “bringing together and integrating existing archaeological research data infrastructures, so researchers can use the various distributed datasets and new and powerful technologies as an integral component of the archaeological research methodology”. 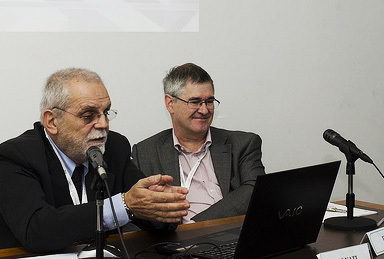 Franco Niccolucci (PIN) and Julian Richards (ADS) leading the ARIADNE kick-off meeting in Rome. Photo by Virginia Niccolucci/Michele Seghieri. As Deputy Coordinators, ADS has been heavily involved in the overall planning and management of the project across all 17 workpackages. We also have specific tasks underway in many of the individual workpackages, including gathering data for a survey of all the existing metadata schemas in the archaeological domain, identifying and assessing good practice across the network, and supporting the University of South Wales in their work on SKOS thesauri, semantic annotation and linking, and Natural Language Processing. This is where the work undertaken through the aforementioned SENESCHAL project is going to be particularly useful, as the formal creation of these national thesauri in SKOS format will feed directly into the international thesuari work for ARIADNE (for further details, see Michael Charno’s recent blog post). An example of this would be the translation of some of the terms between English and Scottish Gaelic within the Royal Commission on Ancient & Historical Monuments of Scotland (RCAHMS) Monument Type Thesaurus. As leaders of the transnational access and training workpackages, ADS has also begun coordinating the Web presence for the online transnational access providers, and the selection process for physical transnational access at PIN and Consiglio Nazionale delle Ricerche (CNR) in Italy, and the ATHENA Research and Innovation Centre (ATHENA RC) in Greece, to be undertaken later in the project. 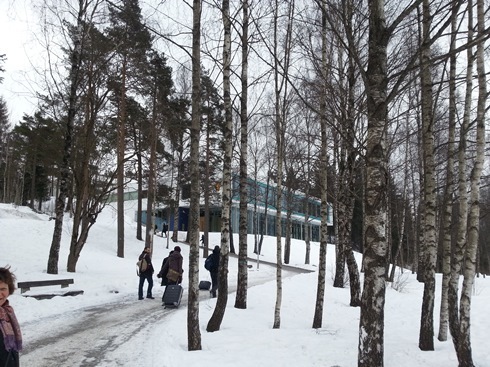 After the kick-off meeting in March in snowy but beautiful Oslo, we have now begun our work on Local Content in a Europeana Cloud (LoCloud). A three-year EU Competitiveness and Innovation Framework Programme (CIP) funded best practice network, LoCloud is coordinated by Norsk Kulturrad and is made up of 32 partners across 26 European countries. LoCloud follows on directly from CARARE and EuropeanaLocal, and will “combine the metadata mapping methodology of CARARE with cloud computing technology, to help small to medium sized heritage organisations make their content discoverable within Europeana”. LoCloud partners arriving for the kick-off meeting at the National Archives of Norway in Oslo. Photo by Sarah McSeveny-Åril. In addition to providing more content to Europeana through existing partnerships, ADS is the aggregator for the UK, and is already identifying potential organisations that may benefit from participation in LoCloud. As such, while LoCloud is a European project, we hope it will also help us strengthen our partnerships within the UK. From our own archives, ADS plans to provide an update to the reports from the Grey Literature Library already made discoverable within Europeana through the CARARE project, as the Grey Literature Library has already grown by a further 3,000 reports! ADS also plans to provide the resource discovery metadata for all of our existing archives, and more comprehensive metadata for a variety of other resources. In addition, we are looking forward to hosting many of the content providing partners from across Europe in York for a technical workshop in September, and as leaders of the dissemination workpackage, will be organising future workshops at international conferences to promote the results and services available through LoCloud. After the kick-off meeting in June in beautiful, sunny Paris (at last! ), we have now begun work on New scenarios for a community-involved archaeology (NEARCH). A five-year EU Culture Programme funded project, NEARCH is coordinated by the Institut national de recherches archéologiques preventives (INRAP) in France, and is made up of 14 partners, across 10 European countries. NEARCH follows on directly from the recently completed ACE project, which “identified a cultural crisis and a crisis of values and ideas that outlined the EU agenda ‘European Modernity’. NEARCH aims to assess the implications of the crisis in the fields of Archaeology and Heritage, and to propose new ways of working and interacting. The project will also explore the different dimensions of public participation, as well as the multi-scalar significance of archaeological heritage intertwined with different processes underway in today’s Europe”. Within NEARCH, ADS will primarily be involved in working with the organisers of the digital ‘Day of Archaeology’ to expand participation throughout Europe, developing mobile technologies to help the public engage with historic records and resources, and contributing to the production of digital publications about archaeology. 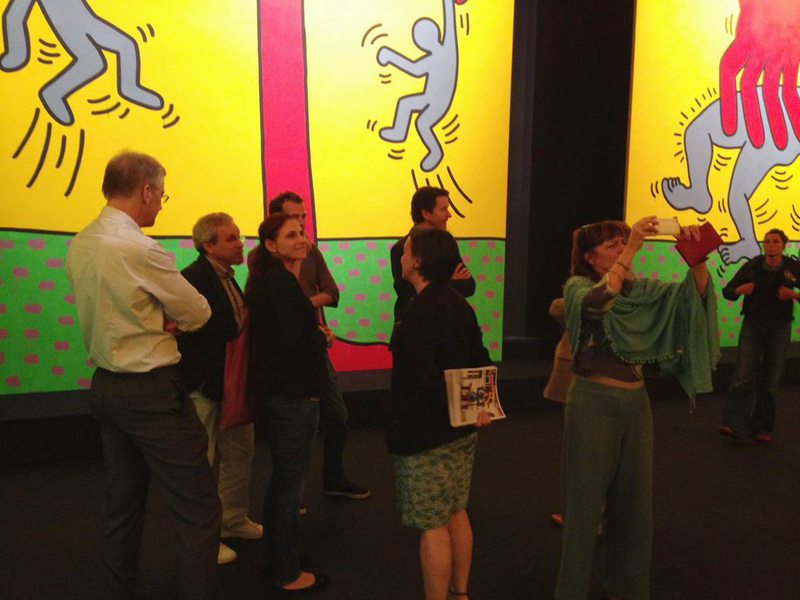 Partners enjoying the Keith Haring exhibit presented by host partner CentQuatre at the close of the NEARCH kick-off meeing in Paris. Photo by Holly Wright.